Then there’s a pair of us! Don’t tell! they’d advertise – you know! Emily’s father was a Yale graduate, successful lawyer, Amherst College treasurer, and a United States Congressman. Her grandfather was a Dartmouth graduate, accomplished lawyer, and one of the founders of Amherst College. The Dickinsons were strong advocates for education, and Emily benefited from early schooling. She studied English and classical literature, Latin, botany, geology, history, “mental philosophy,” and arithmetic at the Amherst Academy which she attended for seven years in her youth. At age 15, Emily spent ten months at Mount Holyoke Female Seminary, but for the rest of her life Emily seldom left home. She occupied her time with family and household activities, including caring for her ailing mother. Emily enjoyed baking and gardening along with writing and reading. Dickinson was familiar not only with the Bible and Shakespeare but also with contemporary popular literature. She admired the poetry of Robert and Elizabeth Barrett Browning, as well as John Keats. 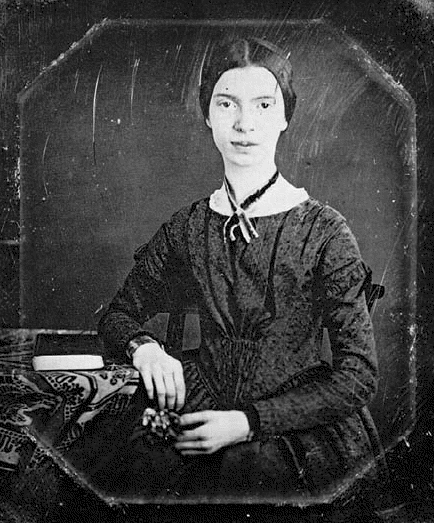 Although she seldom went out and visitors were scarce, Emily actively maintained many correspondences with friends and relatives. She regularly enclosed poems in letters to friends, but she was not publicly recognized as a poet during her lifetime. Upon her death in 1886, Dickinson’s family discovered 40 hand-bound volumes consisting of nearly 1800 poems that had been written by Emily – some in pencil, only a few titled, many unfinished. Emily’s sister had the poems edited and arranged into volumes. The first collection of Dickinson’s work was published posthumously in 1890 but it was heavily altered by the publishers to fit the conventional poetic rules of the time. A complete and mostly unaltered collection of her poetry became available for the first time in 1955 when The Complete Poems of Emily Dickinson was published by scholar Thomas H. Johnson. In 1981, the original order of her poems was restored by Ralph W. Franklin, in The Manuscript Books of Emily Dickinson . This entry was posted in 800 Literature and tagged Emily Dickinson, poem, poet, poetry. Bookmark the permalink.